THE FOOD Safety and Standards Authority of India (FSSAI) ordered a nationwide ban on all variants of Maggi noodles on June 5, leading to a massive food product recall—the biggest in the country so far. The recall was initiated after FSSAI authorities found lead beyond the permissible limit and monosodium glutamate without appropriate labelling in the popular two-minute noodles. Food recall procedure involves removing a potentially harmful product from the market to ensure consumer safety and has been recognised as the most effective means of protecting public health globally. Earlier this year, FSSAI had ordered the recall of several energy drinks, including Monster and Restless, due to non-compliance with safety standards. But this was not part of any systematic food recall procedure in line with global practice. Unlike Western countries such as the US and European nations, India does not have an official recall policy, says Bejon Kumar Misra, an expert on consumer protection policy. Section 28 of the Food Safety and Standards Act, 2006, provides for recall of food products, but it does not specify necessary details, such as the role and responsibility of food business operators (FBOs), including manufacturers, retailers, importers and suppliers, timeline of the recall process, tracking of compliance and follow-up. The absence of such critical guidelines explains why food companies such as Nestlé have acted less responsibly when it comes to safety standards. 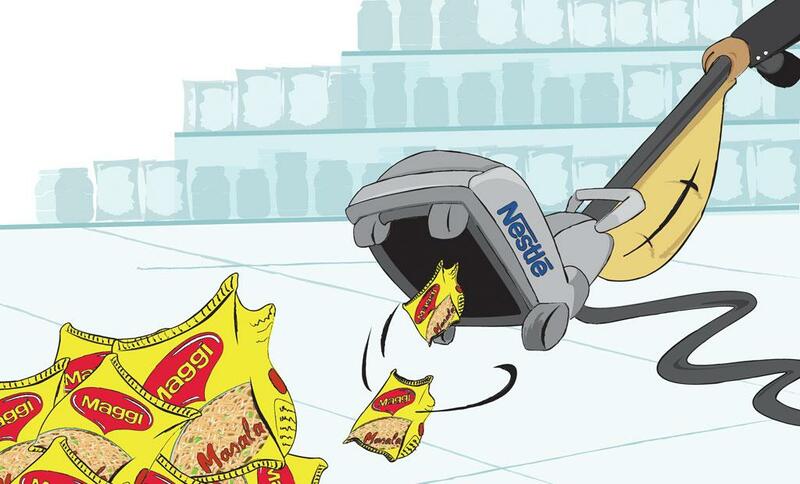 Despite excessive lead found in samples, Nestlé continues to maintain that Maggi noodles are safe and is contesting the recall order in court. This is in contrast to the recall of beef products in Europe by Nestlé in 2013 after finding horse DNA in two of its products. Unlike in India, the company took responsibility and apologised to consumers. In some cases, recall has been voluntary—recall of Sunchips by Frito Lay’s and Special K red berries by Kellogg’s in the US this year (see ‘Back from the market’). Meanwhile, there have been 32 food recalls in Canada since March and 33 in the US since April. “In general, food companies voluntarily perform recalls when approached by government agencies. However, there have been a few instances when they have not and the government has been forced to take legal action to remove the products from commerce,” says Tony Corbo, senior lobbyist at Food and Water Watch, a Washington-based consumer rights group. FSSAI had developed rules for recall in 2009, but there has been no update. No FSSAI official was available for comment. In April this year, the apex food body issued a draft regulation, “Food Safety and Standards (Food Recall Procedure) Regulations, 2015” for public comments. It is open to the public for feedback till August 1. The draft is a comprehensive document on the recall process. Addressing the common interest of industry, government and consumers, it clearly mentions possible reasons or triggers for a food recall, methods of recall communication and role and responsibilities of FBOs. The draft puts the onus of recall largely on FBOs, with the food authority, Central and state, acting as a supervisory body to monitor progress. As stated in the draft, a recall can be initiated due to any complaint or public health hazard identified by the manufacturer, consumer or food authority. With little variation, the proposed regulations are broadly in line with features of recall procedures adopted by several countries such as the US, Canada and New Zealand. While the draft incorporates most of international practices, it misses out on a few aspects that are integral to the international recall system. These include “recall classification”, which determines the level of hazard involved. Notably, the 2009 rules had such a provision. The latest draft also needs to be strengthened with respect to a safety alert system. The food authority should have a web-based facility to monitor the recall and keep the consumers informed. “Government recall mechanism needs to be more transparent,” says Devinder Sharma, a food and trade policy analyst. An example of such a transparent facility is Europe’s Rapid Alert System for Food and Feed. It details the list of product recalls that have taken place, product type, category, notification date, reasons of alert, hazards and action taken. India urgently needs a comprehensive document on food recall and FSSAI should finalise the proposed draft without much delay. “Product recall is a logical step in the regulatory system. Unfortunately, the Indian regulatory system is weak,” says politician Brinda Karat. J P Dadhich, sub-regional representative, International Baby Food Action Network, a global network of organisations, welcomes FSSAI’smove, saying it is a step in the right direction. “The challenge now is to finalise the guidelines quickly and implement them effectively,” he says. Sharma notes that the recall of Maggi should serve as a wake-up call not only for the government but also industry. Considering the huge number of food products available in the markets today, increasing cases of contamination and growing globalisation of food and food chains, India needs to have a system in place wherein an unsafe product can be timely put out of consumers’ reach, a system that can tell the end consumer in the remotest parts of the country about the risks associated with unsafe but available food. I feel that strong food laws should be made in India where whosoever is acting against norms/ adding non-edible /harmful product should be punished. Only banning their product is not sufficient.